Taking inspiration from the John Blair House gardens in Williamsburg, Virginia, the Blair Gardens collection by C&F Enterprises features a modern floral pattern set against a crisp white background. Reverse to a white geometric pattern for additional styling options. The floral print is shown in delicate pink, tan and green. The ruffled white and gray geometric bedskirt adds extra dimension to the bed. Finish off the look with the beautiful coordinating throw pillow and valance. The swirling vines and subtle flowers create a timeless look. Made by C&F Enterprises. 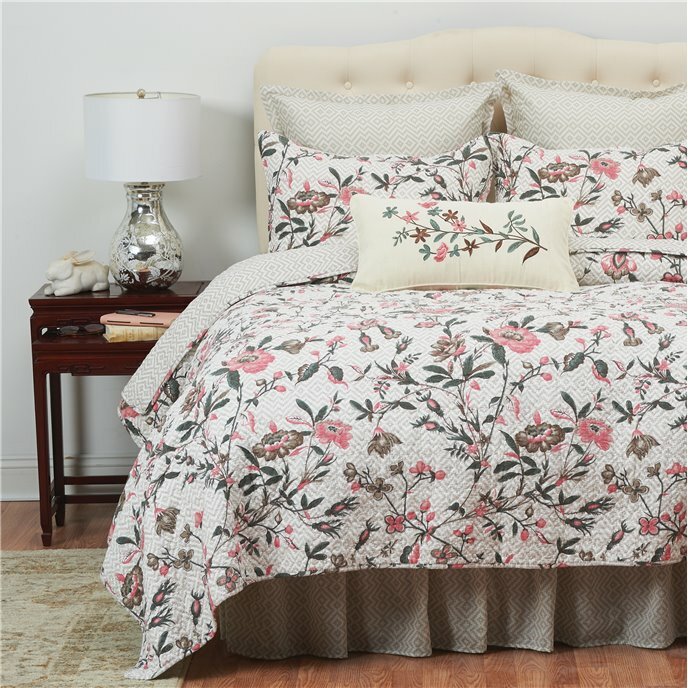 Inspired by the gardens surrounding the John Blair House in historic Williamsburg, Virginia, the Blair Garden quilt set combines traditional florals with modern design for a timeless look. Swirling vines and delicate flowers in a subtle colorway of pink, tan, and green intertwine atop a gray and white geometric print. Reverse to an allover gray and white pattern for additional styling options. Designed in collaboration with WILLIAMSBURG Brand and crafted of cotton, this quilt set is machine washable for easy care. 1 F/Q Quilt and 2 Standard Shams, Measurements: Quilt 90" x 92"; Sham 20" x 26", Hand Guided Vermicelli Stitching, Coordinating Accent Pillows, Euro Shams and Bed Skirt Available Separately, Cotton, Fill Material Cotton, Machine Wash Cold, Line Dry, Imported. Made by C&F Enterprises. Inspired by the gardens surrounding the John Blair House in historic Williamsburg, Virginia, the Blair Garden quilt set combines traditional florals with modern design for a timeless look. Swirling vines and delicate flowers in a subtle colorway of pink, tan, and green intertwine atop a gray and white geometric print. Reverse to an allover gray and white pattern for additional styling options. Designed in collaboration with WILLIAMSBURG Brand and crafted of cotton, this quilt set is machine washable for easy care. 1 King Quilt and 2 King Shams, Measurements: Quilt 108" x 92"; Sham 20" x 36", Hand Guided Vermicelli Stitching, Coordinating Accent Pillows, Euro Shams and Bed Skirt Available Separately, Cotton, Fill Material Cotton, Machine Wash Cold, Line Dry, Imported. Made by C&F Enterprises. A gray and white geometric design creates a subtle, yet stylish pattern atop the Blair Garden euro sham. Designed in collaboration with WILLIAMSBURG to coordinate with the Blair Garden bedding collection, this sham features a tailored flange and envelope closure. Crafted of 100-percent cotton for easy care. Measures 26" x 26", Tailored Flange for a Finished Look, Coordinating Quilts, Accent Pillows and Bed Skirt Available Separately, Cotton, Fill Material N/A, Machine Wash Cold,Tumble Dry Low, Imported. Made by C&F Enterprises. A grey and white geometric design creates a subtle, yet stylish pattern atop the Blair Garden bed skirt. Designed in collaboration with WILLIAMSBURG to coordinate with the Blair Garden bedding collection, this 18" bed skirt is versatile enough to complement a variety of styles and patterns. Crafted in a platform style, the Blair Garden bed skirt has a cotton drop and is machine washable for easy care. Blair Garden Queen, 60" x 80", drop 18", Split Corners, Coordinating Quilt Set, Accent Pillows and Euro Shams Available Separately, Sides: 100% Cotton; Platform: 100% Polyester, Fill Material N/A, Machine Wash Cold,Tumble Dry Low, Imported. Made by C&F Enterprises. A grey and white geometric design creates a subtle, yet stylish pattern atop the Blair Garden bed skirt. Designed in collaboration with WILLIAMSBURG to coordinate with the Blair Garden bedding collection, this 18" bed skirt is versatile enough to complement a variety of styles and patterns. Crafted in a platform style, the Blair Garden bed skirt has a cotton drop and is machine washable for easy care. Blair Garden King , 78" x 80", drop 18", Split Corners, Coordinating Quilt Set, Accent Pillows and Euro Shams Available Separately, Sides: 100% Cotton; Platform: 100% Polyester, Fill Material N/A, Machine Wash Cold,Tumble Dry Low, Imported. Made by C&F Enterprises. Dainty embroidered flowers comprise a subtle spring design atop the Blair Garden pillow. Designed in collaboration with WILLIAMSBURG to coordinate with the Blair Garden bedding collection, this pillow features a piped edge and removable insert with a convenient zipper closure. Crafted with a 100-percent cotton cover, spot cleaning makes caring for this pillow a breeze! , 12" x 24", Coordinating Piped Edge, Filled and Finished in USA, 100% Cotton Cover, Fill Material Polyester, Spot Clean, Imported. Made by C&F Enterprises. A Colonial Williamsburg pattern of garden florals in pink, taupe, green, and gray on a classic geometric backdrop in crisp gray and white. 15" x 71", including 1.5" header, 2.25" rod pocket. Exceptional value valance has a single layer of fabric. We offer the complete ensemble in the Blair Garden pattern by C & F.